Beth, from Design Your Dwelling, was so kind as to write this post for me. She’s local (sort of) and has great style. Plus, she’s a farm girl. I love her little gallery wall! Please check her out and show her some love! I have never lived in a house larger than 1800 square feet. That includes growing up, the first home I owned and the home I live in now, which is a beautiful farm house in rural Iowa that looks big on the outside but is only around 1300 square feet. I've always had to come up with clever ideas to make the most of my small space. That being said, I was excited for the invite from Katie to be a guest blogger to share ideas to live large in a small space! Everyone loves color and it often seems that painting the walls a dark color, even an accent wall, is the best way to add color in our homes. The truth is, it makes your room feel small. Lighten up your walls with light, neutral colors and create a contrast with stark white woodwork. Then, bring in color with crisp contrasts like black, red and blue with accessories like pillows, lamps, throws and curtains! Our guest bedroom is a perfect example. The previous owner painted the guest bedroom a dark maroon and mint green, (poor color combination to start with - yikes) and covered the windows with maroon roller shades (the ones impossible to work). Repainting the room was first on my agenda when I moved here! 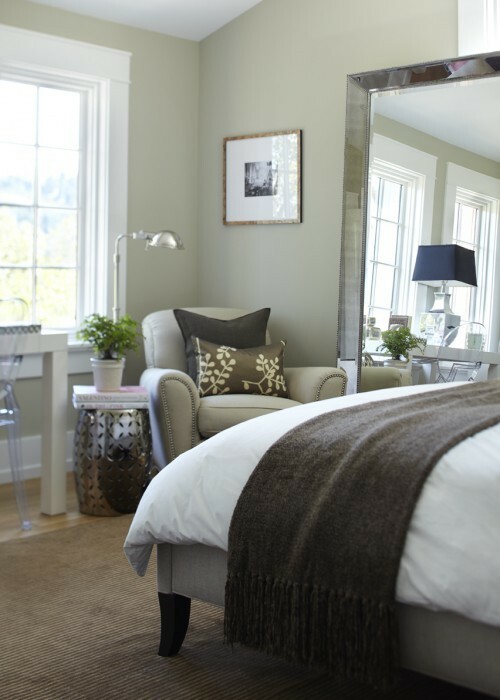 The room is only 10 x 12 but once it was painted with a neutral color the bedroom felt 100x larger. 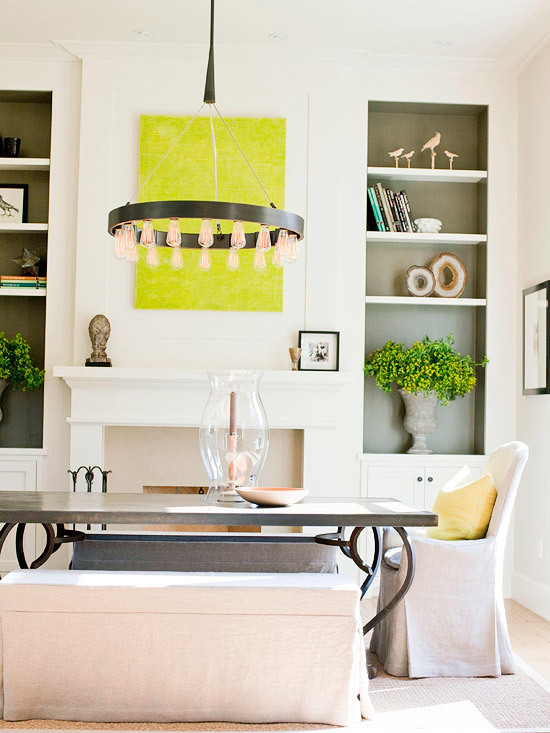 If you do nothing else, lighten up the walls in your home and your space will expand ten-fold! Mirrors are a fantastic way to create the illusion of space - and to see your beautiful reflection! Mirrors reflect light, which will illuminate any room and create depth. They work best position opposite of entry ways and windows. Standard ceiling height is generally 8 to 10 feet. To create the illusion of higher ceiling, hang your curtain rods a few inches above your windows or even closer to your ceiling and hang 84" or larger curtain panels. 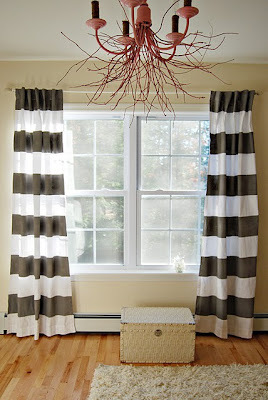 This will create the illusion of height and add color to your space. 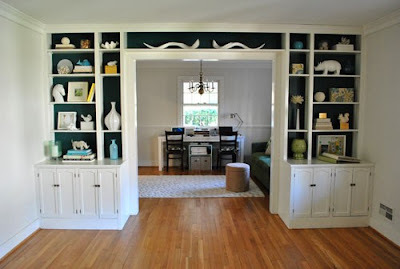 To create height and depth, build floor to ceiling shelves and paint the inside of the cabinets a darker color. The darker color on the inside of the cabinets will create a sense of depth. Now, for my favorite way to expand your space - hang your flat screen TV on the wall. Our living room and dining room is one long narrow room, approximately 11' x 24'. When I first moved here, the 64" flat screen TV sat angled in the corner of our living room space (keep in mind this was a former bachelor's tv). We did a little re-wiring and hung the TV on the wall. This created so much additional space in our living area and gave us a place for storage too. Hanging your TV on the wall is a change you wont regret! I hope these ideas help you to "Live Large In a Small Space!" You can find me over at Design Your Dwelling - feel free to stop in anytime! 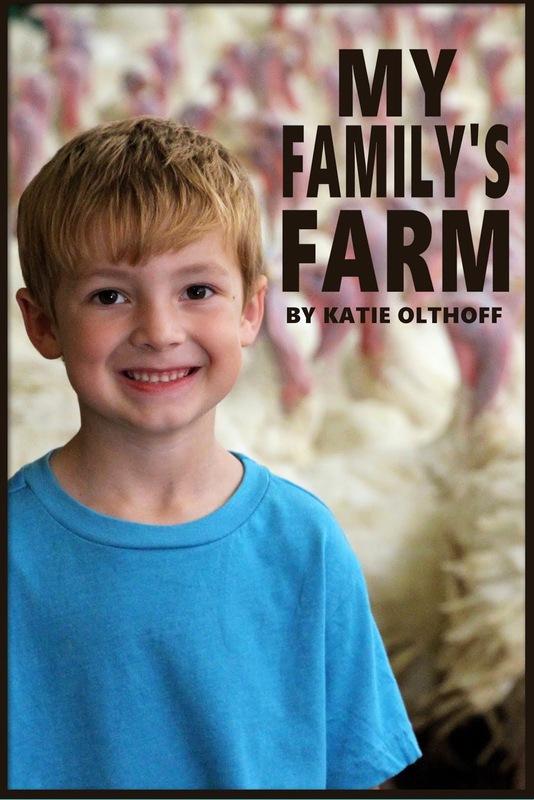 Thanks Katie, for the opportunity to be a guest blogger at On The Banks of Squaw Creek! I have a serious thing for built-ins…they are gorgeous, and add so much character and personality to a space, not to mention amazing storage! But how do you get built ins if your house doesn’t already have them? Or – you could hire someone else who can. Now, I realize that hiring a carpenter might not be in everyone’s budget. But, having a carpenter build custom storage is a LOT cheaper than adding on a room. And now, without further ado, built-in (p)inspiration! That was just a small sample from my pinterest boards. Follow me there to see more! Many Little Houses were built without a dedicated office space, but smart Little House dwellers have found a solution to that problem: The Cloffice. 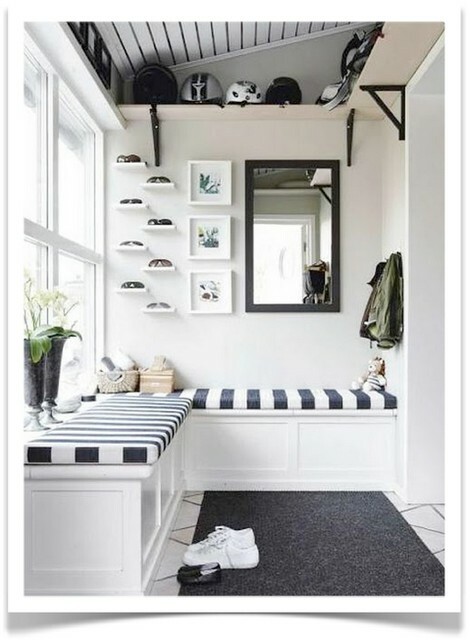 Unfortunately for me, my house lacks decent sized closets, so a cloffice is out of the question, but I can see how this would work in many Little Houses! Even without a closet to spare, some creative space planning can help you carve out a corner of a room to use as an office, too. See how seemlessly this office is integrated into the living room? This built-in, under-the-stairs office is genius! Even if you aren’t handy enough to build this yourself, hiring someone to do it is a heckuvalot cheaper than adding a room on to your house! The other type of space that seems to be missing in Little Houses is a playroom. And a quick google search of “kid friendly family rooms” really doesn’t bring many results. But some have incorporated a play space into their living room. Behind the sofa is a great place to use for toys and toy storage. These bookshelves could easily be filled with toys instead of books, leaving a sophisticated space for adults on one side of the room, and plenty of space to store toys when they’re not in use. But if you don’t have space to divide your room into two zones, a play table can easily serve as a coffee table. Check out these two rooms! I’ve loved hearing your ideas on purging, decluttering and clothes organization, and I’d love to hear what you have to say about multipurpose rooms, too. Any other unique room combinations out there? For more Little House inspiration, be sure to check out my Pinterest boards! As I said before, I am a borderline hoarder. Hoarding + Little House = TROUBLE. These are the items that I plan to fix, plan to refurbish, or plan to repurpose. But for some reason, I just haven’t gotten around to it yet. I love to make something new out of something old, but even if I completed all those projects, my house wouldn’t have room to hold them all! Solution: They need to go. At my garage sale a couple of years ago, I let Carter Station go through our basement and sheds and get rid of some of the unfinished furniture projects I had laying around. They paid me for my junk, and I knew that my projects would finally get finished and go home with someone who loved them. I kept the things that I was planning to use in my own home, but after two years, some of those things are still out in the garage, so it’s probably time to invite someone out here again. My dance trophies and hubbies 4-H trophies are a prime example of sentimental items that take up a TON of room. Solution: Take a picture. If we set up a quick photo session and photographed these items, I wouldn’t feel guilty at all about getting rid of them. Adam’s art pile just kept growing and growing, so I kept a few of my favorites and took pictures of the rest. And then, *gasp* threw them away. Sometimes it’s hard to get rid of things that people gave you as a gift. Especially if that person is close to you. Solution: Just do it. Last summer, close to our five year wedding anniversary, I got rid of any wedding gifts that had never been opened or used. Decorative items that weren’t my style were given to someone who would appreciate them or donated. Kitchen gadgets were given to college aged cousins who might need them. And my kitchen thanked me. Solution: Get tough. I had to enlist my husband’s help with this. We had sorted toys before but kept ALL the tractors, because Adam loves tractors! But this time, we had to be more discriminatory. Bart went through and decided which tractors were worth keeping and which weren’t, and we were able to get rid of a ton. Involving your children with this sounds nice, but it just hasn’t worked for us. Maybe Adam is still too young, maybe he’s too selfish, or maybe we haven’t done a good enough job modeling this for him, but he has no interest in giving his toys to other kids. We’ve had much better luck just doing it when he’s not around. He has missed some of the toys and asked for them, but we just tell him that they’re lost and suggested something else to take its place. 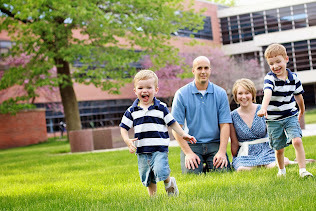 We get a LOT of hand-me-downs for our boys, thanks to our amazing family. But at times, that means that the drawers and closets are stuffed TOO full. And, since I’ve had two boys in 3 years, I have clothing in an array of sizes. I probably have 6 or 8 different sizes of blue jeans, not to mention the maternity clothes I’ve accumulated. Solution: Simplify. For the boys, I tend to get rid of (or pass on to the next little one) any clothes that are hard to match. Pants with stripes down the side are harder to match than blue jeans or solid colored “soft pants.” So, they get the boot. Maybe it’s boring, but I love being able to grab a solid colored shirt and solid colored pants for my boys when we have busy mornings and call it good. Last summer, I threw away most of Adam’s socks and bought two packs of identical white socks, and one pack of colored “church” socks. It has made our lives so much easier. I no longer have to lay out an array of socks in order to find matches. For my own clothes, it’s a little trickier. So tricky, in fact, that I haven’t really figured out what to do. I never know what’s going to fit me on any given morning, so I want to keep an array of sizes handy. Anyone have any tips for me? Do you have a category of “stuff” that is just out of control? Is it the amount of stuff that is keeping you from loving your little house? Share your problems and solutions with Squaw Creek on Facebook. 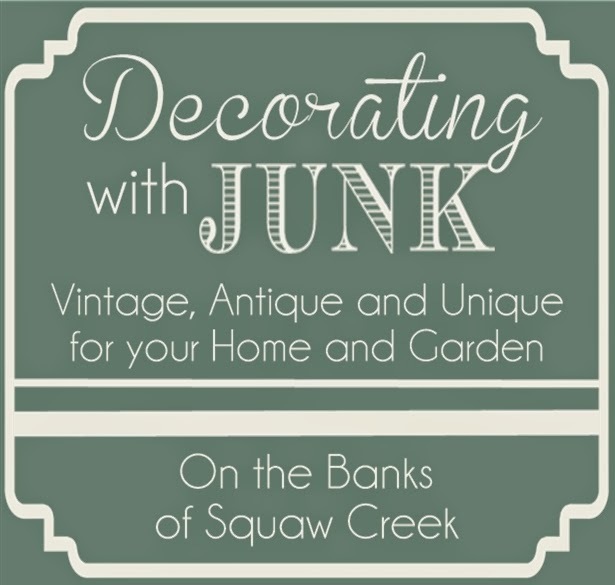 *This post is a part of the Love Your Little House series here at Squaw Creek. If you have a Little House, please grab a button and share the love! Little Houses have less room. It’s a fact. Therefore, Little Houses can hold less stuff. I am by no means, an expert on decluttering. In fact, I’m more of a hoarder than a minimalist. But, faced with the reality of my small space, I’ve been gradually working on purging things for the past couple of years. Start small, with easy stuff. Don’t start with the sentimental stuff. That’s too hard. As you get better at decluttering and purging, you’ll gain the confidence to deal with the tougher stuff. Don’t try to force others in your family to purge. You have to let them do it at their own pace. Do, however, limit their space so that it is their problem to deal with and doesn’t affect the rest of the family. For example, it’s vital that my husband’s clothes and “stuff” stay in his office. A Bowl Full of Lemons – This blog had a VERY popular 21 day challenge last year. I followed along with most of it, and it really made a big difference, although it’s probably time to do it again. Next up, I’m going to share some “categories” of precious items that are hard for me to get rid of, and pretend like I have a solution to the problem. In the meantime, where do you look for decluttering inspiration? Any decluttering or purging tips? Or are you just a fellow boarderline hoarder like me? Join in the conversation with Squaw Creek on Facebook. The Love Your Little House series came from the frustration Bart and I have had when trying to plan an addition to our house. We live with our two little boys in a 1500 square foot farmhouse, which, quite simply, was NOT built for a 21st century family. It was actually built over 100 years ago, when life was much different. When we bought the house, we made the decision to remodel and renovate, and hoped to add on at some point. The floor plan is slightly awkward, the rooms are small, and there is virtually NO storage space. We wanted to add a big family room that was open to the kitchen, another bedroom, bathroom, and a farm office. But that’s all much easier said than done. Problem #1 is the location of the house – the way it sits in relation to our lane, the road, and the septic tank. No matter which way we went, we were met with problems. Problem #2 is the work we’ve already done. It seems like there is no way to add on without undoing some of what we’ve already completed. And we have so much blood, sweat and tears invested that we really aren’t willing to do that. Problem #3 is money. Enough said. So, we are letting go of our dream to add on. Who knows…maybe we’ll change our minds some day, but right now it’s not part of the plan. Not the immediate plan, the 5 year plan, or even the 10 year plan. But that doesn’t mean we’re going to settle and just endure the problems we have in our Little House. We are going to solve those problems, without adding square footage. Instead of adding space, we are going to add function. We will continue to make changes that will make our house “work” better for our family, and we will NOT agonize over the fact that our house is small. We will learn to make it work. We will embrace our Little House. We will Love our Little House. Bart just asked me if we should quit giving Isaac (10 months) bottles, and instead, just use sippy cups. “So-and-so’s son is 10 months and he only uses sippies.” I thought for a second that he’d gone off his rocker. Those are the types of things I worry about, not him. What prompted this completely out-of-character question? And then I’d put Isaac on the floor on his tummy and beg him to roll towards me. It’s so easy to compare yourself, your life, or your children to everyone else’s, especially when you’re active in social media like blogging or Facebook. I know, as a mom, I am definitely guilty of it. But I try to remember that what people post online is often (but not always) the side of themselves they WANT people to see. For example, I might mention how bright Adam is and how he could recognize his letters so early, but I probably haven’t talked about how other kids his age are starting to color inside the lines and he just scribbles all over the page. And, honey…Isaac’s bottles are just fine. It seems like more and more people are. And while more and more are worried, fewer and fewer have a direct link to a farm where that food is produced. That’s why I volunteered for Common Ground. Common Ground is a grassroots organization of farm women who have volunteered to help answer your biggest questions about food production. Are pesticides on my food safe? What are GMOs and are they okay to eat? For too long, the media has been the only one trying to answer these questions. And because fear sells, they haven’t been very reassuring. But we believe that no one can answer your food questions better than the people who grow it. We have the answers to these questions and more. So, let Common Ground be your direct link back to the farm. We are a network of wives and moms who are experts on how food is produced, and we want to talk to you about agriculture in the US. Come to us when you are worried about your food and we will use our firsthand knowledge of how food is produced to answer your questions honestly. Together, we can bridge the gap between the farm and the table, and find some Common Ground.